In a breather for the mining industry, the Supreme Court on April 4, 2018, allowed the export of iron ore from loading points on river jetties while disposing a joint special leave application filed by Vedanta Resources and another local mining company. The Apex Court bench of Justice Madan Lokur and Justice Deepak Gupta maintained the iron ore for which royalty has been paid to the state government and has been extracted on or before March 15 this year, should be allowed to be transported. Senior advocate Shyam Divan and Kapil Sibal, appearing for the firms, had argued those ores were excavated prior to March 15 and firms had statutory approvals for export. Concurrently, after the Anti-Corruption Bureau of the Vigilance Department and the Central Bureau of Investigation (CBI) declined to investigate the process of lease renewals, Goa Foundation, a voluntary organization complained to the Goa Lokayukta, who issued notices on April 4th to former Chief Minister Laxmikant Parsekar, ex-mines secretary Pawan Kumar Sain, and Director of Mines and Geology Prasanna Acharya, in the case concerning the alleged illegal renewal of 88 mining leases. The three have been asked to file replies by May 7, 2018. The legal tangle is far from over as a strong environmentalist lobby pulls no punches when it comes to pinning the State government down on issues of apparent excess and illegality when it comes to Mining in Goa. For years together, a thin sheen of mining dust, often iron ore, would coat the streets, the hoods of parked trucks, cover samosas displayed on tables at restaurants, coat bottles of loose petrol refilled in mineral water bottles hung outside bars, even lie sprinkled atop the hair of workers jostling their way about Goa’s mining zones and nearby villages particularly in Bicholim, Sanguem and the Sonshi cluster. The dust caused respiratory problems, polluted the very pristine air that Goa is known for, and killed slowly, as environmentalists across India claimed. And, despite repeated complaints and contentious allegations of illegal and unregulated mining across the nation’s smallest state, the industry thrived. And with it thrived the pollution, the illegality and, what was perceived as, the bullying of a State refusing to relent. After March 16, 2018, all of that changed. The Goa government just didn’t see it coming. The Supreme Court order on February 8, 2018, rapped the State for failing to follow due process in renewing 88 mining leases for 20 years. It quashed the Goa government’s order to renew the licenses of mining companies in the state and permitted them to carry out mining activities only till March 16 after which fresh leases would have to be issued on obtaining environmental clearances. The government will have to start a fresh auction process all over again. Goa government’s wildest nightmare has come true bringing to a screeching halt, the ultra-contentious mining activities in the state. The Judiciary has, in a display of judicial activism, filled the chasm created by legislative empathy and rapped the executive. That said, the Supreme Court’s order cancelling mining leases from mid-March 2018 is perceived as stringent and with scant regard for the mining economy or those who depend on it. The Supreme Court order is seen as focusing on the greed of miners and complicity of the polity who renewed leases instead of holding fresh auctions. The crux of the issue being: The government in Goa renewed the leases barely a week before the Centre brought out the Mines and Minerals (Development and Regulation) Amendment Ordinance on January 12, 2015. The ordinance was later passed by Parliament. This, despite the BJP being in majority, at both, the Centre and the State. The timing and the hurtle to renew the leases before the Ordinance was brought out is perceived as an affront to the Rule of Law. 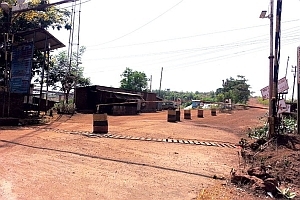 “Why did the Goa government rush into renewing the leases when the Centre was coming out with a law on the same?” says Sanguem-based agriculturist Alfred Furtado. “There certainly seems to be a vested interest in the State attempting to wrest control from the judiciary and dodge the law,” he added. A contrarian argument that is being offered today across Goa through State-run platforms is that the court’s ruling does not compensate for the lack of sound policy, ensure implementation or immunise those who are affected directly because of the Supreme Court ruling. In what is being posed as a direct threat to the interest of thousands of workers and transporters leading to colossal losses to the State exchequer, India’s export figures and financial institutions that have lent to mining companies and financed mining equipment and vehicles, the judgement is flayed as being constricted in approach and reach. Pausing periodically to use an asthma inhaler to assist breathing, Rewa expresses relief at the Supreme Court judgement. “I hope the government has learned a lesson at least now and keeps a check on illegal mining,” she says. “I am not against mining at all. But I can’t turn a blind eye to the ruin of our crops, fields, our children’s health. I was beginning to wonder if there was any law and order left in the country at all,” she adds. There are real issues that the mining industry will face, particularly after the Supreme Court order. Should a miner fail in getting back the same mine in fresh auctions, the new ‘allottee’ will be obliged to take over all the operational expenses, including debt service on mining equipment and operational civil works. And, if the extant miner has procured personal loans to fund a child’s education abroad or invest in some residential property or another business by hypothecating the mine’s assets or any part of it, the liability to that extent will not be part of what the new licensee takes on. Ironically, the BJP governments both at the Centre and the State now find themselves in a quandary. While the State has had to eat humble pie following their inglorious snubbing by the Supreme Court which reversed, in one clean sweep, the goings on in the state’s mining circles. The Supreme Court has, in the recent past, been taking stringent measures against irregularities in the iron-ore mining sector across India and for the Goa government to then attempting to bypass the auction route for lease renewal was asking for trouble. The Supreme Court bench of Justices Madan B. Lokur and Deepak Gupta had given leaseholders a month till March 15, 2018 to manage their affairs and wind up their operations until fresh mining leases and environmental clearances were granted. And now, that too has come to an end. “The urgency suddenly exhibited by the State seems to be make-believe and motivated rather than genuine” and the ‘undue haste’ in which the state government acted gives the impression that it was “willing to sacrifice the rule law for the benefit of the mining lease holders”. In Honda village near Bicholim in Goa, as Mahendra Shetye stands outside his bar Shetye Bar and Restaurant, he recalls the times when during afternoons and evenings his bar would be packed with people and he would earn as much as Rs 10,000 daily. From 1986 when he started business till date when mining is taking a body blow, his income has been reduced to a fraction of what he’d make earlier. “Mining bandh hone se bohut logon ko apne gaadi ke loan repay karna mushkil ho jayega,” (With mining stopping a lot of people will have difficulty in repaying vehicle loans) says Shetye. He too had taken a few bank loans that he has barely managed to repay. Understanding the extent and reach of Supreme Court’s judgement on mining in Goa, takes a little more than mere theoretical reasoning. “It affects thousands of those who derive their daily bread from the mining activities,” feels a Bicholim-based bar conductor Rajaram. “Whenever mining is stopped, my business gets affected the worst. My customers being truck drivers, mechanics and transport workers who work in the mining industry,” he says even as he wipes off the sheen of iron ore dust that layers his bar tables. “Mining se Dhool mitti se tabiyet to kharab hoti hai, par kya karein, dhandha bhi to karna padega…nahin to bhada kaisa dega,” (Health suffers because of the mining dust but what can we do. I have to do business. How else will I pay my rent?) says Rajaram. Rajaram’s stand, on the face of it, waters down the harm unleashed by illegal mining and environmental hazards that wreak havoc across India’s smallest state yet speaks reams of how economic dependence thrust upon a citizenry by an obtuse State can affect the people’s basic Right to Life. Society has as much at stake with Mining as the State itself. While on the one hand, as is flouted, there’s an apparent loss to business but scratch below the surface and the irregularities strike the very core of human existence: The Right to Life! It’s time the State steps in to mend ways and find a solution that’s viable and…legal!